It was a double brush with greatness on Sunday, as local legend Arthur Nakane was performing his famous one-man band in Little Tokyo’s Japanese Village Plaza. A bearded stranger seemed very interested in Nakane’s music and stopped for a long while, to chat and listen to songs. 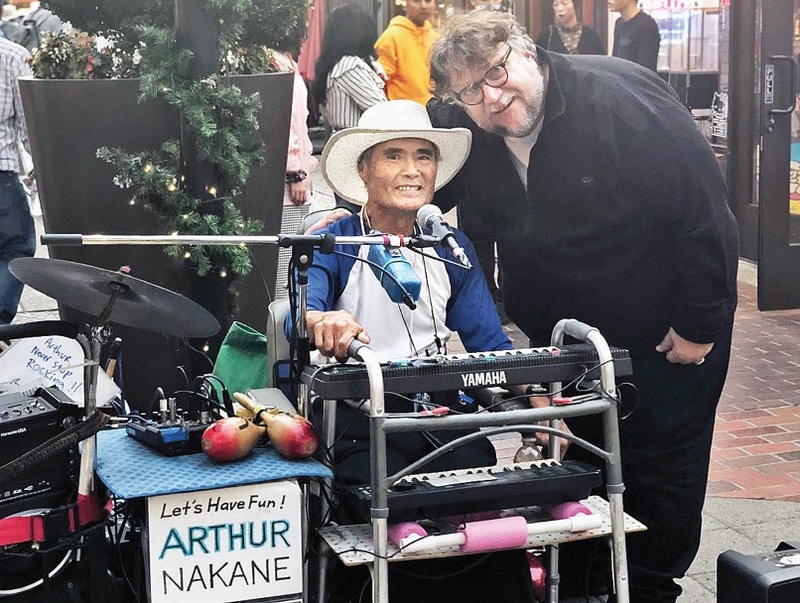 “I did not know who he was while I was talking to him and playing songs for him and his lovely daughter,” Nakane reported about the man who went by the name Guillermo. The man turned out to be Oscar-winning director Guillermo del Toro, who no doubt was looking for some calm relaxation on what must have been a very stressful weekend. One of his homes, filled with priceless horror movie memorabilia, was among those threatened by the Southern California wildfires. It has been reported that his property escaped any serious damage. Arthur is the best! We all love him and wish him the best of health. He is an inspiration to all.